Barbie Skipper Babysitters Inc. dolls and playsets let kids be the babysitter with a Skipper or friend doll, a baby or toddler doll, furniture and accessories matched to classic childhood moments. 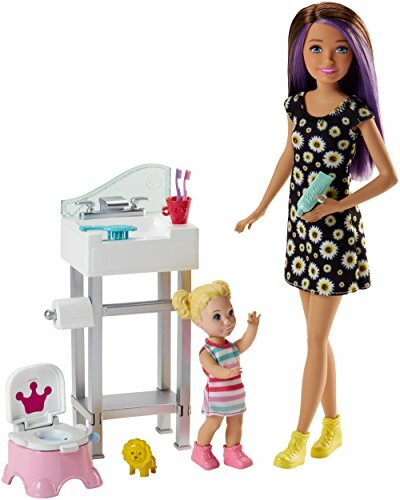 The potty training-themed set has so many fun, working features to add inspiration to storytelling: spin the toilet paper for a touch of realism; open the potty seat's top and use the knob to flip the "water" inside and see it "flush"; close the lid and let the toddler doll "stand" on it to help her reach the sink. Additional accessories -- a tube of toothpaste, one toothbrush, a cup, a brush and a lion toy for baby -- allow for role-play and teaching moments along with all-day fun! With so many pieces to inspire possibilities, kids can play out so many babysitting adventures. Kids will love exploring their first babysitting jobs in their imaginations because you can be anything with Barbie! Collect all the Babysitters Inc. dolls and accessories to fill a babysitting schedule full of fun (each sold separately, subject to availability). Barbie Skipper Babysitters Inc. playset includes Skipper doll wearing fashion and accessories, toddler doll wearing fashion and shoes, flipping potty seat with working lid, sink with spinning toilet paper and themed accessories. Skipper doll cannot stand alone. Colors and decorations may vary. Play out classic babysitting moments with this Barbie Skipper Babysitters Inc. playset! If you have any questions about this product by Barbie, contact us by completing and submitting the form below. If you are looking for a specif part number, please include it with your message. Masha and the Bear - set of 2 moveable figures toy russian doll Masha's tales birthday party, the perfect choice would be funny!